Coloring. Cast Albums. And CALMNESS. 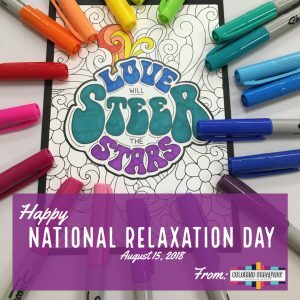 Happy National Relaxation Day! 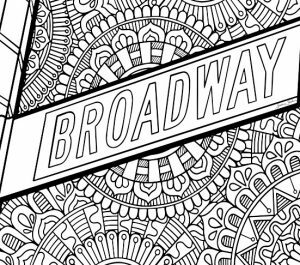 Do Coloring, Broadway and Relaxation go together … But of course! Relaxation: the state of being free from tension and anxiety; recreation or rest, especially after a period of work. It’s National Relaxation Day. A holiday that was initiated on August 15, 1985 at the prompting of nine-year-old Sean Moelle. “He suggested that too much work can make us sick, run down, tired and he’s right. “ – Catie Fitgerald from Enhanced Health Solutions. To relax, we will obviously be grabbing our colored pencils and markers and spending some quality time coloring Broadway with our favorite Broadway Musical Cast Albums of course. What could be more relaxing than that? Coloring is a great tool for relaxation. Here are some great reasons why Coloring and Relaxation go together. When you color, you are using multiple parts of your brain (the creative, the kinesthetic, the logical) and when you do this there is a physiological relaxation response that happens in your body. 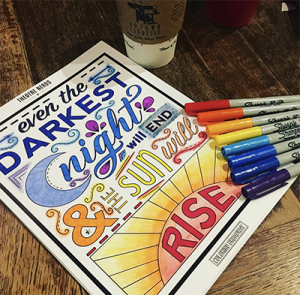 Coloring is what they call a “non-cognitive” activity, which means that it is something you can do without thinking about it too much. But the secret super power of coloring is that it quiets that part of your brain that is always thinking and talking to you – it gives it something to focus on, which means that you now have space to relax and breathe … and think about other things if you’d like. Gets your Creative Juices Flowing. Coloring helps kick off the creativity. It gives you a little structure – a place to begin. Instead of getting stumped by a blank page – You simply get to choose your colors, fill in the spaces and create your masterpiece. Ever had those moments when you got so caught up in something that you lost track of time? Do you remember how good you felt after that? Getting fully focused on something – in the state of FLOW – is actually RELAXING! When you’re fully focused, that “monkey mind” is quiet and you’re not thinking about anything else! But, Coloring just isn’t my jam. Many other activities create the same benefits – some people knit, some people run or go to dance class, some sing at full volume – and some go to as much musical theatre as possible. The trick is to find the things that help YOU relax – the things that lift you up, that the light you up and that create space for you to rejuvenate. We need you in full sparkle! Coloring is TOTALLY my jam! ← Happy Birthday Eliza Hamilton – We’ll Tell Your Story!